I am now using Friday’s blog space to provide draft versions of the Modern Monetary Theory textbook that I am writing with my colleague and friend Randy Wray. We expect to complete the text during 2013 (to be ready in draft form for second semester teaching). Comments are always welcome. Remember this is a textbook aimed at undergraduate students and so the writing will be different from my usual blog free-for-all. Note also that the text I post is just the work I am doing by way of the first draft so the material posted will not represent the complete text. Further it will change once the two of us have edited it. Under inflation targetting monetary policy regimes, central bankers use the persistent pool of unemployed (and other forms of labour underutilisation, for example, underemployment) as a buffer stock to achieve a desirable price level outcome. If their inflation outlook rises above their target rate they will induce higher rates of unemployment by increasing in interest rates until they are satified their inflation target is being met. While some extreme elements of the profession, who still consider rational expectations to be a reasonable assumption, will deny any real output effects, most economists acknowledge that any disinflation engendered by this approach will be accompanied by a period of reduced output and increased unemployment (and related social costs) because a period of (temporary) slack is required to break inflationary expectations. The real question then is how large are the output losses following discretionary disinflation? There is overwhelming evidence to suggest that the cumulative costs of this strategy in real terms have been substantial. Economists measure these real costs in terms of sacrifice ratios, which is the accumulated loss of output during a defined disinflation episode as a percentage of initial output expressed as ratio of the accumulated reduction in the inflation rate. For example, if the sacrifice ratio was two it would mean that a one-point reduction in the trend inflation rate is associated with a GDP loss equivalent to 2 per cent of initial output. Figure 13.1 is a simple graphical depiction of the sacrifice ratio concept and captures the way most empirical studies have pursued the estimation of sacrifice ratios. The cumulative output loss as a consequence of the actual output falling below potential output is depicted by the shaded area. 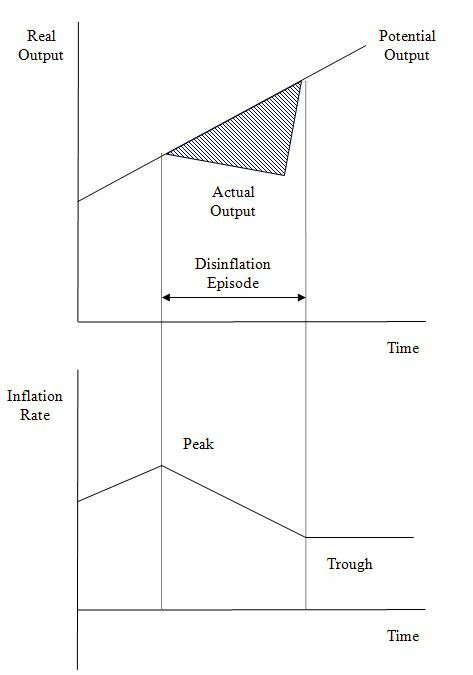 In Figure 13.1, we have deliberately constructed output to resume at its potential level at the exact end of the disinflation period (defined as the period between the peak inflation and the trough inflation). This is the normal assumption adopted in empirical studies. The depiction in Figure 13.1 assumes that the disinflation episode has a relatively finite, short-term impact on real GDP growth and before long the actual growth path converges on the potential path (which was unchanged by the policy change). However, in the real world, it is clear that a prolonged period of reduced real GDP growth lasts beyond the formal disinflation period and that the potential real GDP growth path also declines as the collateral damage of low confidence among firms curtails investment (which slows down the growth in productive capacity). As a consequence, the estimates of sacrifice ratios, based on the conception shown in Figure 13.1, will be biased downwards because they ignore the impacts of output persistence and hysteresis. The concept of persistence means that actual output remains below its potential after the disinflation period has finished. The longer this output gap exists, the longer is the persistence. Relatedly, hysteresis (in this context) refers to the permanent losses of potential output that arise as a consequence of the disinflation policy. The important point is that to accurately estimate the sacrifice ratio researchers must not only consider the short-term losses but also the longer-term losses arising from persistence and hysteresis. Figure 13.2 stylises the impacts of persistence and hysteresis arising from a disinflationary policy stance. It is clear that the real output losses are much greater than would be estimated using the restricted concept shown in Figure 13.1. From the inflation peak, real output falls immediately as before. But after a time, the reduced levels of economic activity erodes confidence among consumers and firms. Consumers fearing even higher unemployment restrict consumption spending and firms respond to the lack of sales order by cutting investment plans. 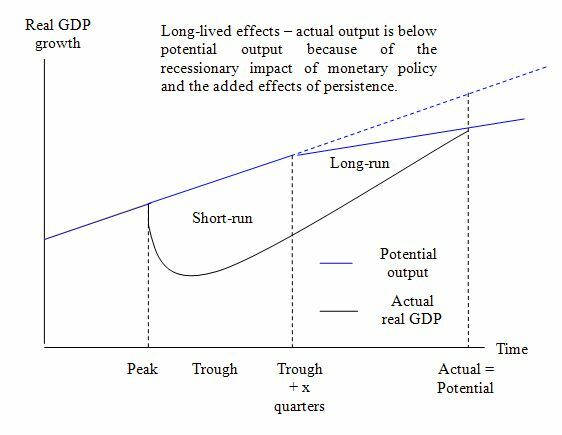 Two impacts occur as a result: (a) the potential real output path falls (from Trough + x quarters on Figure 13.2), reducing the growth capacity of the economy; and (b) actual real output deviates from its potential path for much longer that otherwise would have been the case. As a result, the estimated costs of the disinflation are much larger. Eventually actual and potential may converge but at that point there is less output and national income and almost certainly, persistently higher unemployment. Economies reach a difficult point where the mass unemployment, initially caused by the failure of aggregate demand induced by the contractionary policy stance of the government, also becomes capacity constrained as a result of the falling potential output level. The fiscal austerity policies pursued by governments during the global financial crisis also have had this impact. It is much harder to then restore robust growth because it takes longer periods to also ensure there is potential capacity to support it without triggering inflation. Formal econometric analysis does not support the case that inflation targeting delivers superior economic outcomes in terms of reducing the costs of disinflation.. Both targeters and non-targeters enjoyed variable outcomes and there is no credible evidence that inflation targeting improves performance as measured by the behaviour of inflation, output, or interest rates. There is no credible evidence that central bank independence and the alleged credibility bonus that this brings bring faster adjustment of inflationary expectations to the policy announcements. There is no evidence that targeting affects inflation behaviour differently. Sacrifice ratios estimates confirm that disinflations are not costless; the average ratio for all countries over the 1970s and 1980s was around 1.3 to 1.4. Significantly, the average estimated GDP sacrifice ratios have increased over time, from 0.6 in the 1970s to 1.9 in the 1980s and to 3.4 in the 1990’s. That is, on average reducing trend inflation by one percentage point results in a 3.4 per cent cumulative loss in real GDP in the 1990s. Australia, Canada, and the UK, who announced formal policies of inflation targeting in the 1990s, do not have substantially lower sacrifice ratios compared to G7 countries who did not announce such policies. Australia does record a lower average ratio during the targeting period than in the 1980s, averaged across the three methods it is 1.2 per cent, however this figure is not lower than the average for all previous periods. Canada records a higher sacrifice ratio in the 1990s of 3.6 per cent. The ratio for the UK during inflation targeting is significantly higher at 2.5 per cent (relative to quite low sacrifice ratios in previous periods). Italy, Germany, Japan and the US, average 0.6, 2.3, 2.9 and 5.8, respectively. The evidence is clear that inflation targeting countries have failed to achieve superior outcomes in terms of output growth, inflation variability and output variability; moreover there is no evidence that inflation targeting has reduced persistence. Other factors have been more important than targeting per se in reducing inflation. 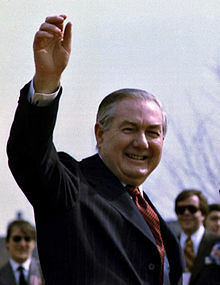 Most governments adopted fiscal austerity in the 1990s in the mistaken belief that budget surpluses were the exemplar of prudent economic management and provided the supportive environment for monetary policy. The fiscal cutbacks had adverse consequences for unemployment and generally created conditions of labour market slackness even though in many countries the official unemployment fell. However labour underutilisation defined more broadly to include, among other things, underemployment, rose in the same countries. Further, the comprehensive shift to active labour market programs, welfare-to-work reform, dismantling of unions and privatisation of public enterprises also helped to keep wage pressures down. It is clear from statements made by various central bankers that a belief in the long-run trade off between inflation and employment embodied in the NAIRU has led them to pursue an inflation-first strategy at the expense of unemployment. Disinflations are not costless irrespective of whether targeting is used or not. An average sacrifice ratio of 3.5 in the 1990s means that any attempt to bring down inflation nowadays with 1 per cent-point will result in a cumulative loss in GDP of 3.5 per cent on average. In terms of unemployment the latter can be interpreted roughly speaking as a cumulative increase by 7 per cent. The increase in the sacrifice ratio over time illustrates that reduced inflation variability allows more certainty in nominal contracting with less need for frequent wage and price adjustments. The latter in turn means less need for indexation and short-term contracts and leads towards a flatter short-run Phillips curve. Thus a consequence of inflation targeting is that the costs of disinflation become higher. Unemployment is primarily due to lack of aggregate demand. This is mainly the outcome of erroneous macroeconomic policies … [the decisions of Central Banks] … inspired by an obsessive fear of inflation, … coupled with a benign neglect for unemployment … have resulted in systematically over tight monetary policy decisions, apparently based on an objectionable use of the so-called NAIRU approach. The contractive effects of these policies have been reinforced by common, very tight fiscal policies. One of the major problems of inflation targetting as a policy paradigm is that it has been accompanied by a view that fiscal policy has to be passive and not compromise the inflation target. As a result economies have tolerated persistently high rates of labour underutilisation despite having achieved low inflation. As noted earlier in the Chapter, persistent unemployment results not only in massive losses of real output and national income, but other real costs are also endured by the nation, including the depreciation of human capital, family breakdowns, increasing crime, and increasing medical costs. These additional costs, in particular the depreciation of human capital, also mean that the effectiveness of the unemployment pool as a price anchor deteriorates over time, with ever larger numbers of fresh unemployed or underemployed required to function as a price anchor that stabilises wages. Given the scale of these costs, it is unlikely that using a persistent pool of unemployed (or casualised underemployed) is the most cost effective way to achieve price stability? An understanding of the macroeconomic principles developed in the course thus far would suggest that a better alternative to the unemployment buffer stock to price stability would be to utilise an employed buffer stock approach. This might also be conceived as an alternative way of managing the unemployment program that the government deems necessary to attain price stability. Thus a superior use of the labour slack necessary to generate price stability is to implement an employment program for the otherwise unemployed as an activity floor in the real sector, which both anchors the general price level to the price of employed labour of this (currently unemployed) buffer and can produce useful output with positive supply side effects. Between 1945 and the mid-1970s, western governments realised that, with deficit spending supplementing private demand, they could ensure that all workers who wanted to work could find jobs. Although private employment growth was relatively strong during this period, governments were important employers in their own right, and also maintained a buffer of jobs for the least skilled workers; for example, in the major utilities, the railways, local public services and major infrastructure functions of government. By absorbing workers who lost jobs when private investment declined, governments acted as an economic safety valve. … sector of the economy which effectively functions as an employer of last resort, which absorbs the shocks which occur from time to time, and more generally makes employment available to the less skilled, the less qualified. He concluded that societies with a high degree of social cohesion (such as Austria, Japan and Norway) were willing to broaden their concept of costs and benefits of resource usage to ensure that everyone had access to paid employment opportunities. The employment buffer stock approach – which is referred to in the literature as the Job Guarantee – refers to a policy framework where the government operates a buffer stock of jobs to absorb workers who are unable to find employment in the private sector. Thus the government provides an unconditional, open-ended job offer at a given wage to anyone who desires to work. THE REST OF THIS MATERIAL WILL BE FAMILIAR – BUT I WILL COMPLETE IT NEXT WEEK FOR THE SAKE OF OUR DRAFT WHICH IS GETTING CLOSER TO COMPLETION NOW. NEXT WEEK I WILL ADVANCE THE BRITISH-IMF CASE STUDY. I HAVE A MASSIVE COLLECTION OF DOCUMENTS AND OLD SCANS THAT I HAVE COLLECTED OVER THE YEARS ABOUT THIS INCIDENT INCLUDING THE EXCELLENT BRITISH TREASURY FREEDOM OF INFORMATION REQUEST DOCUMENT SET. WE WILL TALK ABOUT THIS NEXT WEEK. (c) Copyright 2013 Bill Mitchell. All Rights Reserved. Looking forward to your post about the UK IMF fiasco. I still don’t see why MMT rejects the option of switching taxation to an asset tax as a way to avoid all the unemployment and consequent waste that you describe so well. My impression is that an asset tax wouldn’t create a pool of unemployed. Instead it would prevent inflation by creating a pool of bargain priced assets – it would mean that return on capital was used to pay the tax instead of being used to bid up asset prices. It would cause the financial system to reflect the reality that every unused hour of machine or human time is permanently lost. Spending on consumption and tangible direct investment would make more sense than seeing savings eroded by an asset tax -so employment would be boosted. First, I don’t see the relevance of your criticisms of inflation targeting. The system you propose, i.e. JG, also “targets inflation” in the sense that if inflation is excessive, government cuts aggregate demand (just as it does in a “no JG” system). The CRUCIAL DIFFERENCE between the two systems is that under your system, those losing regular jobs can do a JG job, whereas under conventional arrangements, those losing regular jobs become unemployed. But under BOTH SYSTEMS, government targets a 2% or similar rate of inflation. Second, the entire “buffer stock” idea strikes me as irrelevant, and for the following reasons. When making the case for X, normal procedure is to concentrate on ways that X differs from the existing system or is AN IMPROVEMENT on the existing system. And given that the existing system (unemployment benefit) has much the same “buffer stocking” characteristics as JG, why mention buffer stocks? Certainly where the JG wage is equal to benefits, the “buffer stocking” effect is much the same. If I was arguing the relative merits of petrol versus diesel to power cars, I wouldn’t mention the fact that in both cases the wheels of the car revolve when the car is going forward. Revolving wheels occur in both cases, so I’d just ignore the “revolving wheels” phenomenon. Moreover, the main purpose of a buffer stock is to maintain or stabilise the price of something. And the price of unskilled labour nowadays is underpinned to a significant extent by, or primarily by minimum wage laws: which renders the whole buffer stock idea even less relevant. Third, can we have your reasons for rejecting temporary subsidised jobs a la JG in the private sector? The UK’s Work Programme involves the private sector, as have other temporary subsidised employment systems in the UK over the last 30 years or so. Yes, and it is widely regarded as an utter failure. Whereas the Future Jobs Fund, which excluded the private sector, was held as a qualified success. Public funds should provide labour for public projects, with the output available to all of us. We all paid for it so we should all have access to the benefits. Common goods and services so produced can be exploited by all existing and any new businesses as well as individuals. That increases the competitive mix helping to drive forward innovation and productivity. Subsidising certain private enterprises ensures that ownership of output remain with those subsidised. There is no justification for that. If they want the output they should pay the full price for it. “We all paid for it so we should all have access to the benefits.” Agreed. And if employment at your local supermarket is subsidised, you have “access to the benefits” don’t you? “Subsidising certain private enterprises ensures that ownership of output remain with those subsidised.” Regardless of whether JG is confined to the public sector or not, “ownership of the output” does not “remain with those subsidised”. E.g. if I purchase baked beans at a supermarket that employes subsidised JG labour, I then become the owner of the baked beans, don’t I? What I think you were referring to, Neil, was what economists call the “incidence” of a subdidy: that’s the extent to which (in the case of an employment subsidy) the employer / employee / customer / employer’s suppliers etc etc benefit. I.e., implement a subsidy, and the benefits will be very widely dispersed. The number of people involved in the Future Jobs Fund at any one time was around 50,000: that’s a mere 2% or so of total numbers unemployed in the UK. Given that small number it’s easy to find relatively productive public sector jobs. In contrast, if JG is going to have any significant effect on unemployment, that 2% needs to be vastly expanded. But expanding that number means running into diminishing returns: especially as the public sector is not as good at employing the relatively unskilled as the private sector. Moreover, the fact that A PARTICULAR employment subsidy for the private sector didn’t work out too well is not brilliant evidence that subsidies for the private sector can NEVER work. In contrast, if there are fundamental theoretical reasons for thinking private sector JG cannot be made to work, then I’m all ears. Put another way, where is the evidence that the relative success of the Future Jobs Fund had anything to do with its being concentrated on the public sector rather than some other factor, like the way it was organised? It’s very good at doing it. Much better than the private sector. The private sector wants free skills for low pay and doesn’t want to develop them. Because that’s the easiest way to a profit. Hence why Universities are now Tech Colleges – where the risk of training for the wrong skill is entirely with the individual. In other words the private sector is ineffective. The size of the unemployment queue is ample evidence of that. In fact the public sector was originally the employer of last resort – before the Freetards managed to gain power and crippled that function of the public sector. The fundamental theoretical reason is the one you keep filtering out. The product of the labour should belong to those that bought it ie all of us. There is no justification for any other position. If the private sector want the output, it should pay the full price for it. Otherwise we will have the output and use it to help increase the diversity of businesses in the private sector so that it can fulfil its social remit of supplying adequate jobs and output. That’s what you need to do during a slump – rebuild and reseed. Not assist the remaining weeds take over the garden. Interesting to see China announce today that they’ll buffer stocks of pork. “The private sector wants free skills for low pay and doesn’t want to develop them.” Of course: the private sector is profit motivated. If you have a total aversion to the profit motive, you could go live in a communist country. There aren’t any left in Europe, but I can recommend North Korea. Anyway, joking apart, the solution to the above training problem is easy: give JG people the choice of training instead of subsidised employment. Indeed that’s already a feature of JG as proposed by Bill, and I have no objections to that feature. Incidentally we used to have a thriving apprenticeship system in the UK untill Labour under Harold Wilson wrecked it by substantially raising apprentices’ pay. So failure to train is not entirely the fault of profit motivated employers: it’s equally the fault of clueless lefties, if the UK’s experience with apprenticeships is any guide. “The product of the labour should belong to those that bought it ie all of us.” I’ve already answered that point above (by referring to baked beans). But I suppose I’ll have to repeat the point. Here goes. If a wide variety of private employers use subsidised JG labour, then the community as a whole inevitably benefits from that. I.e. you cannot avoid owning “the product of the labour” to use your phraseology. Moreover, the average citizen does not buy the output of JG labour in that employing that labour is not a burden on them. That is, the effect of JG (whether public sector only or public plus private sector) ought to be to raise GDP. Thus “all of us” don’t make any sacrifice to get JG labour employed. Re your final three paragraphs, either they or meaningless, or I’m too stupid to understand them. You’ll have to expand on them. And the whole community benefits even more if public employers use JG labour – because there is no skim off the top. The example is simple. If a private employer uses subsidised workers to create a copyrighted asset then you have something paid for by the public purse, that the public is literally prevented from using and is not used for the public good but for private profit. That is an increase in rentier ownership and income that is both unfair and immoral. So its nothing to do with stock movement. It’s to do with capital assets and improvements. The private sector is demonstrable ineffective. Subsidising them makes them inefficient as well as ineffective – because they then fail to take into account the full cost of labour. As they do now with tax credits – hence the people washing cars and the machines stood idle. The JG is set at tension with the private sector to discipline its behaviour. You don’t get cheetahs to run faster and get leaner by throwing them hunks of meat so they don’t have to do any work. You get them to chase the gazelles. And has been said countless times, the private sector can have the labour if it pays the going rate. It even gets a hiring de-risk discount from the employment buffer over the current unemployed buffer. Similar a public JG job is open to anybody who wants to take it, and it can be permanent if they want it to be. It is for the private sector and standard public sector to attract people away from it. No complicated time limits required – just good old simple competition. There’s more to life than GDP. Paying people to busk, draw pictures and dance are just as good a use of spare labour output. As is looking after children or the elderly. All of which forces private employers to enrich their job offerings and reverse the chase to the bottom. If nobody wants to do trolley collecting or shelf stacking at 5 in the morning on a Sunday, then perhaps you need to look at a machine or a different system. I see no benefit in subsidising the status quo. The JG is an exercise bike for a leaner, more supple private sector. I think it would be good if some of the JG workers would be in the private sector. They would gain work experience from regular jobs as well as personal connections all helping thier eventual placement in the private sector. It would all help keeping the JG pool as efficient buffer stock and as a such, as small as possible. JG jobs are minimum wage jobs after all, you wanna keep that pool as small as possible. Maybe long term unemplyed/JG participants would get placements in the private sector because they are the ones that need most help in finding regular employment. You’re quite right: the empirical evidence actually supports your point. That is, there are studies which show that the subsequent employment record of those who have got JG type work in the private sector is better than those who got JG type jobs in the public sector. Also the evidence is that the sort of training offered as an alternative to JG type work is of little help in finding regular jobs. Obviously that’s not to reject DECENT training: e.g. training that leads to a marketable qualification. But there is much to be said for “learning by doing”. And in practice, the latter learning by doing often turns out to be better than the sort of half baked training that has been offered on some JG type schemes in the past. Some people can be very ironic sometimes. In fact – Painfully so. On top of that he talks about deficits as if we live in a world of final settlement.